A powerful VIN valuation, vehicle appraisal, and car inventory management solution from Laser Appraiser, DEALER STUDIO brings critical market data to an empowered dealership, live on their desktop. Studio levels the used car marketplace with affordable quality and data precision to enable even the smallest independent dealerships to compete in today’s most competitive markets. Discover the right cars and price them for quickest turnover, steep profit and maximum ROI with Dealer Studio. Balance competitive pricing, time in inventory, and profit margin with the Dealer Studio Smart Calc price calculator. Provision car buyers with attractive offers and watch traffic and sales soar. 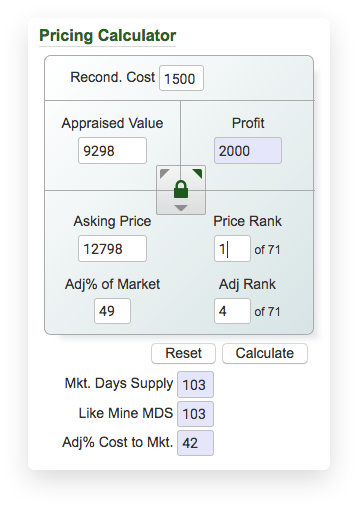 This powerful tool immediately calculates the effects of proposed changes in appraisal amount, profit objective, price rank, and real-time market position. Deal Firmly - price accurately, increase traffic, and stay profitable and competitive! 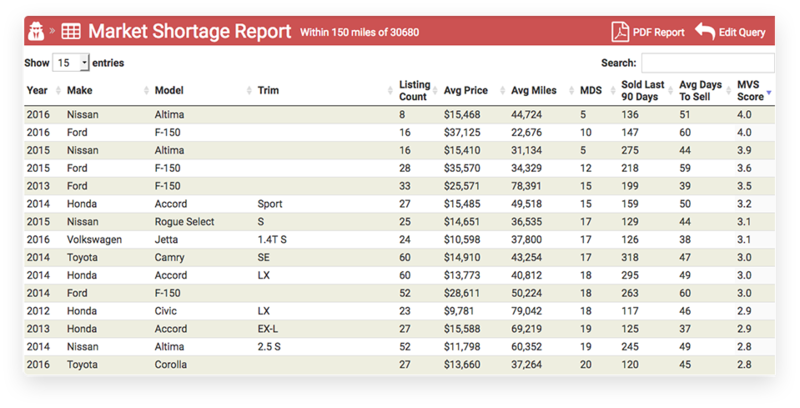 The Dealer Studio Deep Valuator applies best-match algorithms, to valuate inventory automobiles not just by VIN nor trim, but by deeper attributes such as equipment, color, features, and more. The deep insights of Dealer Studio Retail Market View displays real-time prices of identically equipped used vehicles in your market. Know Deep - Know the competition and exactly what each inventory vehicle is worth in your market! Experience the Dealer Studio Market Calibration to tune pricing strategy and turnover. Market Calibration provides a quick and easy visualization to instantly understand market days supply (MDS) and how your cars measure up to identically equipped used vehicles live in your market. 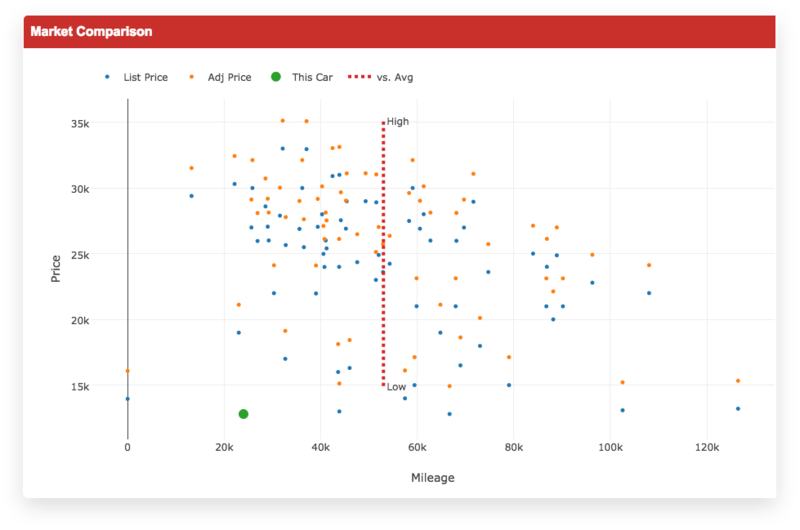 Its comprehensive scatter plot representation compares your vehicle to the market by list price, adjusted price, average price and mileage. Utilize its simple to use interactive analysis tools to zoom in/out, compare data or to save and share. Calibrate your ROI position - Adjust to the Market! Plan smarter purchases and prepare solid inventory with insights from the Dealer Studio Market Spy. These guides utilize live market information to create a list of the top and bottom selling vehicles in a geographical area. Know what cars are trending and which to avoid with Market Spy. Keep buyers browsing on the lot longer with the most popular car selections. Plan Smarter - Earn more profit, more rapidly through wiser inventory selection with Market Spy! Dealer Studio is tightly integrated with the Laser Appraiser Mobile app for Android and iOS smartphones and tablets - the best auto appraisal application and price advisor in the auction lanes. Its fast VIN scanner and accurate pre-sales inventory auction access, featuring Manheim, Adesa, and Auction Edge independents, keeps buyers ahead of the competition and on top of the deals during runs. Market Spy insights and Laser Appraiser Mobile access to vehicle history reports, including CARFAX VIN Scan and AutoCheck Account, provide buying confidence. Buy Confidently - With Laser Appraiser Mobile and Dealer Studio! At the end of the day, we get paid on what we sell. The life cycle of flipping a used car through a dealership is sometimes a bumpy road. Customers can be unpredictable and economic times, weather, seasons, and trends are unstable. Using the right strategies, and with the help of the advanced appraisal and valuation tools employed by the Laser Appraiser Dealer Studio, return on investment will be maximized, profitable, and durable. Join with us and let us work together to Exit Profitably!